AquaClear® Gel Adhesive is a transparent hydrocellular dressing made of absorbent polyurethane polymers covered with a semi-permiable polyurethane film to prevent water and micro-organism contamination. It has an adhesive film border to ensure that it stays secure and additionally prevents bacterial penetration. Daily hygiene is simplified with this waterproof surface. The three-dimensional gel composition of AquaClear® has a water content of 60%. AquaClear® maintains a moist wound environment which helps promote the formation of new tissue during the granulation phase. This is achieved with little risk of wound exudate accumulation, even during prolonged application. Granulation tissue is prevented from drying out in the moist wound environment. During the epitheliazation phase, the moist environment created by AquaClear® Adhesive enhances the division and migration of epithelial cells. AquaClear® Adhesive is latex-free, sterile and individually sealed. The dressing does not stick to the wound and may be changed without damaging new tissue. The transparency and wound measuring grid allows the wound to be monitored without removing the dressing. It will not be dissolved by absorbed wound exudate and can be removed from the wound in one piece without residue. This dressing is specially suitable for the treatment of chronic, slow-healing wounds where the granulation process is not functioning satisfactorily such as leg ulcers and pressure ulcers. It can also be used in the treatment of second degree burns and to promote re-epitheliazation at splint-skin graft donor sites after bleeding has stopped. 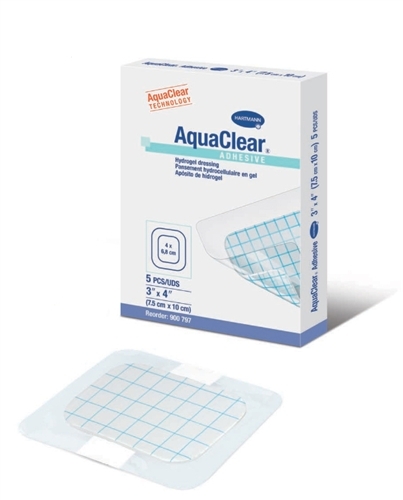 AquaClear® Adhesive is an excellent choice for use on painful skin tears. Available in two sizes - 3" by 4" or 5" by 5".